All the bird sightings in your area and much, much more! What to look for, NOW! every week we'll highlight what to look for when you're out birding. In the last week or so, there has been a considerable ‘movement’ of Little Gulls through the UK. These tiny and frankly cute gulls don’t breed in the country (except extremely rarely) but regularly pass through in quite small numbers each spring and autumn. They may be seen passing at the coast, but they also drop in to feed over inland freshwater bodies, such as lakes, reservoirs and gravel pits. They are very small, with notably blunt wings and a buoyant dipping flight, to pick insects from the water surface. Adults in summer plumage are very clean looking with jet black head and bill, pale upperwings and dark grey underwings (plus bright red legs and feet). First-summers have a black W on the wing and second-summers resemble adults but have a few black spots near the wing tips. The Brambling is the sexier, northern or north-eastern cousin of the abundant Chaffinch. Chaffinches are pretty (males in particular), but Bramblings are prettier still, especially the males (though Brambling females are still leagues ahead of female chaffinches in the looks department). Early April sees them gather and start their return journey to continental Europe, where they breed in Scandinavia, Finland and Russia. At this time of year, you may find them eating blossoms or buds (as well as picking insects). So, look out for these beauties on the move, and listen for the nasal ‘dweeb’ call. A relatively recent coloniser of the UK (first breeding in 1938), the cute Little Ringed Plover remains a pretty scarce breeding bird (fewer than 1,500 breeding pairs). They are inland nesters, choosing edges of gravel pits or similar freshwater, gravelly environments. Smaller and slimmer than Ringed Plovers, Little Ringed Plovers also have duller legs, a largely black (not largely bright orange) fine bill, a yellow eye-ring, no notable wing-bar and a subtly different head patter (with white on the crown). The call is a down slurred rather rasping ‘peeeooo’. Little Ringed Plovers are essentially summer visitors, usually arriving from the second half of March and departing in September. In the previous week, we welcomed home the cute little Sand martin, the earliest of the hirundines to return to the breeding grounds. By now, the first birds will be back in their nest holes. This week, it is the turn of one of our earliest returning warblers, the Blackcap. These days, several Blackcaps overwinter in the UK, but these are thought to be central European (eg German-bred) birds. The first ‘British’ birds are arriving back around now; the first ones are usually males, which draw attention to themselves (deliberately) by singing (to advertise to a mate and proclaim a territory). And the song is beautiful: a rich-toned, fluty warble, interspersed with harsh notes; one of the best songs of early spring. Males have black caps, while females have red-brown caps. Look (and listen) in mature woodland, parkland, and even mature gardens. Yes, folks, the Sand Martins are already pouring into the country, a few weeks earlier than usual in many places. Sand Martins are our smallest hirundines (swallows and martins) and they are not tricky to identify (if seen well). They are sandy brown above and whitish below with a brown upper chest band. So, they lack the striking white rump of the House Martin and the long tail streamers of the Swallow. Listen for the soft buzzing call and search, especially near water, for the little aerial insect feeders whizzing about in typical martin fashion. Sand Martins nest colonially in burrows dug into banks or cliffs of compacted sand etc. Welcome to Bird Watching, the UK’s best-selling bird magazine. 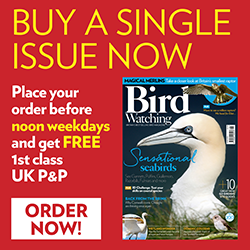 Every issue is packed with ideas, tips, advice, news and reviews, including binoculars and scopes, for anyone with an interest in wild birds, whether they simply enjoy watching their garden birds, or prefer to travel the country and world in search of more unusual species. Our mission is to inspire you to enjoy the world of wildlife that starts right outside your back door. Find out more and sign up to our annual birding challenge #My200BirdYear here.